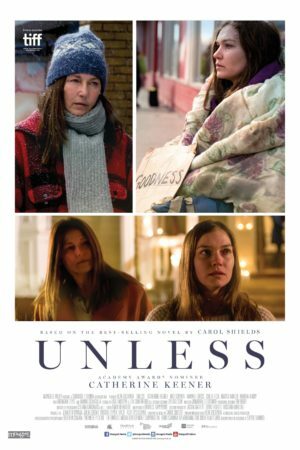 Based on the prize winning novel by Carol Shields, Unless tells the story of the eldest daughter of 44-year-old writer Reta Winters, (Catherine Keener) who suddenly and inexplicably, drops out of college. She soon ends up on a Toronto street corner panhandling with a cardboard sign around her neck that reads “goodness”. Reta tries to come to terms with the inexplicable choice that her daughter has made and to confront the thorny issues of love, morality and accountability.